A ongoing study suggests there’s enough demand to justify a passenger train from Ann Arbor to Traverse City. Now, boosters need to figure out how to pay for it. The glut of travelers who pile into cars and clog Michigan’s highways every summer one day may be able to ditch the car keys for a train ticket Up North. Freight trains now rule the tracks that connect the most populated southern part of the state to the Traverse City area. But discussions have been underway for years to change that, and organizers say they may finally be nearing a breakthrough. Train advocates in northern Michigan are lobbying to establish passenger service from Ann Arbor to Traverse City ‒ and points in between ‒ by summer 2019 for special events. The excursion trains would be a test case to build support for running daily routes. Related: As mass transit talks slow, will Wayne, Washtenaw counties go it alone? And if the early findings from an ongoing feasibility study are on point, the train line could be a hit with a lot of people and places. But organizers admit that a permanent route could be years away. “It could provide options for baby boomers moving up to the region and for college students at Baker, Alma, CMU, U of M,” Jim Bruckbauer, deputy director of the Groundwork Center for Resilient Communities, an environment advocacy group in Traverse City that is spearheading the study. “We see the potential for what this can do for the downtowns between Traverse City and Ann Arbor - Owosso, Clare, Cadillac,” Bruckbauer said. The Groundwork group raised $100,000 to do the study from a federal grant and matching funds from the Michigan Department of Transportation to groups including the National Association of Realtors, Rotary Charities of Traverse City and municipalities along the route. The study should be completed this summer, Bruckbauer said. Preliminary results of the ongoing feasibility study suggest a passenger train, called A2TC, connecting the two cities would attract widespread ridership. Projections that show tourism in Traverse City and surrounding areas is expected to double from 6 million visitors a year to 13 million by 2045, said Alex Metcalf, president of Transportation Economics and Management Systems, the Maryland-based consultant working on the study. “It’s remarkable that the region is getting 6 million visitors, that knocked me over,” Metcalf said. (Other studies have pegged tourism at closer to 3.3 million in Traverse City, but Metcalf said his research included other areas in northern Michigan. Metcalf is still crunching numbers and expects firm estimates by July on costs to improve tracks, the number of riders necessary for the project to be viable and economic impact. Typically, projects such as this involve public-private partnerships and federal and state funding, he said. “So far, we think there could well be a lot of potential here, but only if there are good financials,” he said. Plenty of skepticism remains about the project, however. So far, consultants have yet to release cost estimates, but any plan would require state and federal investments as well as money from communities to build train stations. Costs could add up to $500 million over a couple decades for infrastructure improvements and operations, said Marty Colburn, city manager of Traverse City. He called the A2TC a great idea, but warned that a lot of study remains to be done. Studies indicate demand wouldn’t be a problem. The Michigan State Rail Plan, a 2011 report, found that residents who attended public hearings about the state’s rails favored expanding passenger rail service and chose Traverse City at the top destination, followed by Detroit. The train could be a tourism magnet and a service for the colleges that sit along the estimated 250-mile route including the University of Michigan, Alma College and Central Michigan with about 90,000 students, the early study findings suggest. The Groundwork study also will look at whether the train route could be an economic boost for cities along the route such as Howell, Durand, Owosso, Alma, Mt. Pleasant, Cadillac. And it will look at the feasibility of linking to Petoskey to the northeast of Traverse City. The study is modeling costs on running trains at 60 mph, 90 mph and 110 mph, as well as running trains to areas like Boyne Highlands ski resort and other areas including Mancelona. The state owns the rails between Ann Arbor and Traverse City, but private companies such as Great Lakes Central Railroad lease the railroad tracks and move freight trains along the route. For now, the state has been on the periphery of discussions about the A2TC train and is waiting to see the outcome of the study, said Tim Hoeffner, director of the Office of Rail at the Michigan Department of Transportation. While organizers wants to see excursion trains running in time to take tourists to the cherry festival and film festival in Traverse City, or to the wine country next summer, that only leaves about a year to find an operator and get the trains moving. That seems overly ambitious, Colburn warned. John Langdon, a spokesman for the Michigan Association of Railroad Passengers, said the group would like to see several trains a day run from Ann Arbor to Traverse City and Petoskey. Traverse City tourism, the popularity of winter and summer sports at places such as Boyne Falls as well as casinos along the route justify the investment, he said. Please - someone stop this nonsense. 100 year old romantic yearnings of pleasant trips on trains are pipedreams. in order for this plan to be "successful" it will require either prohibitively high ticket prices, or massive public subsidies, or both. This would be coming at the same point in time where autonomous cars will be increasingly available to connect far-flung cities. If you doubt the costs, consider this: with a $10 ticket, the People Mover loses $ 9.89 per passenger. This comes on a system with both: high ticket prices and massive public subsidies. I won't work folks, it won't work. WOW! My grandparents used to take the train up 100 years ago! Very excited to hear about this! I certainly would be interested in this development! Is this needed presently? Are there better alternatives for the money? How about education? The fact is that travel by personal automobile requires public subsidies for roads, etc. Interurban light rail worked so well in the early 20th century that auto companies focused on destroying them to eliminate the competition. Unfortunately, even if this railroad got going how would people get where they need to go once they got up north? How do people get where they need to go when they take Amtrak and get off at a remote station in the middle of nowhere? Over 400,000 people annually fly into the Traverse City airport, how do people get where they need to go? Ummmmm. from Ann Arbor to Traverse City seems highly desirable. One of the biggest complaints I hear about rail travel is that the trains are never on time. Also, and as part of the reason they are always late, is that they are subservient to freight traffic. We know for a fact that rail transportation in the form of the Detroit People Mover costs several times more to operate the system than the revenue it produces. It would be interesting to see results for the Q-Line, as I expect they would reveal the same. And with a much longer line, I suspect the difference between revenue and expense to be even greater. The few freight trains can be controlled to avoid interference, such as running at night. And upgrading tracks to handle passenger trains will increase freight train speeds. Listen to Kevin. This is just plain stupid. Is there enough right of way to add two more sets of tracks dedicated to passenger rail or commuter rail? Passenger rail cannot mix with freight. Rent a car service in Traverse City is needed to be able to get around. Self-propelled commuter cars are more economical than a locomotive with passenger cars. A lot of planning is needed to make it successful. Sorry Alex but the tracks don't go that way and you don't want to bring CN into the picture. I live in A2 and visit TC a few times each summer. The idea of not having to drive in all that traffic back and forth means I'll be on that train frequently in the summer and fall for business and R&R. Plenty of local transportation options in TC to be used and would probably increase that business significantly. They travel by train all the time in Europe, the US is way behind in the mass public transportation game . AND the biggest benefit is.....no pot holes to deal with! Autonomous cars wont avoid the potholes. I hope they can make a business case for it to go forward quickly. I usually lean conservative / right, so I totally get where Kevin is coming from. At the same time, I just don't see this requiring "massive public subsidies" on the order of the infamously wasteful, one-of-a-kind Detroit People Mover. Basically the infrastructure is already in place (the freight rails), the actual cost would be: a trainset or two (depending on how many roundtrips happen per day), staffing for those sets, and somebody to put up a shed or shelter at the various stops along the line so passengers without umbrellas don't get soaked in the rain. Everybody who boards would be carrying an electronic ticket or voucher from a website, there doesn't need to be staffed train stations at each stop. I'd say let's at least give it a try and see if it's a hit or a miss. If I were a U-M student or anybody up the line, I'd be thrilled to have that kind of option versus driving on I-75. My greatest concern is the barriers that the line owners will erect to avoid having to maintain their railbed. Passenger service requires a higher level of care than freight, and although the rail owners are required to provide access to passenger service, they are skilled at making it as unpleasant as they can. Great Lakes Central has been generally friendly to passenger rail and would benefit greatly from the added revenue; it is not CSX or Norfolk Southern. The State of Michigan should not be in the train business. Period! Why should regular taxpayers be subsidizing vacation travelers? If you have enough money for a vacation up north, pay your own way to get there and back. We have crumbling roads, that are a necessity for life as we know it, and MDOT is wasting it on trains that NO ONE NEEDS. You want railroads, buy them, and maintain them with your fares. Not my taxes. If it is a private operation and not Amtrak then no taxes will pay for it. But, passenger rail doesn’t make money in the US. That’s why Amtrak needs federal subsidies to stay alive. And Amtrak’s new boss is hell bent on making train travel unpleasant so that he can cut long distance trains. Rob says: "But, passenger rail doesn’t make money in the US. " Absolutely so. So answer my question of why taxpayers who have no interest in riding trains, should pay for vacation travelers transportation? The State of Michigan does have a Dept. of Transportation. All transportation is subsidized, you don't think Ford and GM built I-94 do you? And Delta didn't build Detroit Metro Airport, either. The reason there's crumbling roads is because the gas taxes collected come nowhere close to covering the cost of building new roads or even close to covering the cost of maintaining the roads we have now. Trout River, the roads of this country are an absolute necessity for every man, woman, and child in this country. And their maintenance and construction should be an absolute priority for taxpayer dollars. A vacation train should not be on anyone's list for taxpayer funding. MDOT needs to repair roads, before one dime is spent on passenger trains, which are for leisure travel. This line already has tourist trains north of Owosso, some pulled by the steam locomotive 1225. But, the length of trips varies and sometimes even the boarding area, not all excursions start in Owosso. They are just tourist rides, not transportation. You certainly want to bring Petoskey & the Boyne area into the picture. "State transportation officials plan Monday to announce that the $1 billion Interstate 75 widening project in Oakland County, the first major road plan in Michigan to use a private investment model instead of state and federal money, could be completed up to 10 years sooner than planned. Got that? It's $1 Billion dollars to rebuild 18 miles of I-75 in Oakland County, "financed by public money" no less. Why should passenger rail be any different? At $55.55 million per mile, I would wager that the $1 billion cost will never be recovered in taxes and fees. That part of I-75 has about 166,000 cars per day on it. Let’s assume it takes about 1 gallon of fuel to travel the 18 mile section under construction and we know the combined state and federal gas tax is 38 cents per gallon. So that 18 miles stretch will generate about $65,000 per day in gas taxes. That means it will take 42 years to earn back that investment. Of course, that road won’t last 42 yrs or even 32 years, it will need to be rebuilt again in about 20 years. 20 years x $65,000 per = about $475 million. So the taxpayers will lose about $525 Million on that 18 mile section of I-75. I think I'd actually prefer ditching the expense and taxes to own and operate a vehicle in Michigan and take a train as often as possible. Middle America is behind the times in mass transit including rail, and there are multiple options for moving around at your destination. Sometimes, shoveling our dependence on automobiles for long distance travel into the dustbin has to be considered as the solution to a myriad of problems attached to that entire culture. 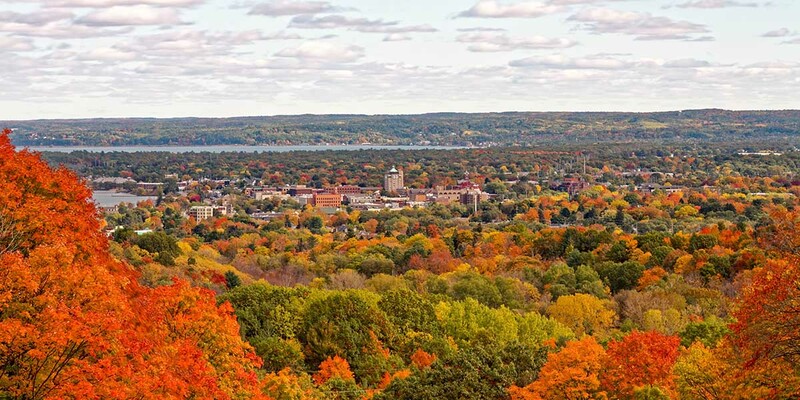 Travel to the Traverse City region is very seasonal. When most people visit the TC area they like to have day trips and visit many different nearby locations which you cannot do without a car. Bring your ski's, fishing equipment,etc. on a train? Not a well thought through idea in my opinion. This is 2019. I wish Amtrack would make a plan. I have been driving Upnoth for 30 years I would love to hop on a train instead of the stress on I-75. It's a death trap with so many people texting and driving!